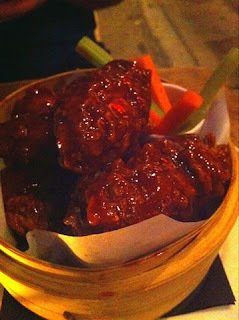 Continuing my quest for amazing chicken wings in NYC Mr. T and I headed to Double Crown Saturday night. Now Double Crown isn’t the type of place you think of when you want wings. It’s British/Asian fusion food, gorgeous décor and much more of a cocktail fancy pants place than a bar. However I heard their Szechuan wings were good so I was mostly going to have those. It was a beautiful night and we got a seat outside on the noisy Bowery. We each ordered a glass of wine and decided to stick with a couple apps for the night. First things first though the bread basket. It had your regular old rolls but also some scones! Really tasty scones filled with raisins and berries served with fluffy whipped butter. I loved these scones. In fact they may have been my favorite part of the meal. I assume this is the British influence on the menu? First up the appetizer I had been waiting for- Forever Crisp Chicken Wings Szechuan style. At first glance these wings look great. They were very big and had a super crispy outside almost similar to Bon Chon or Mad for Chicken. Definite points for that. However the sauce proved to be its downfall. I liked the flavor for sure- hot and sweet with a lingering spicy after taste, but there was soo much of it! The sauce was so thick is literally coated the wing like some sort of tar and left huge gooey globs all over my hands and face. Thank goodness Mr. T and I know each other so well. I was pretty embarrassed by how messy and sticky we both became after the first wing. I tried to take some off but it was impossible. The sugery sweet sauce became too much for me by the 3rd wing and I stopped there. It had potential but did not make the grade. 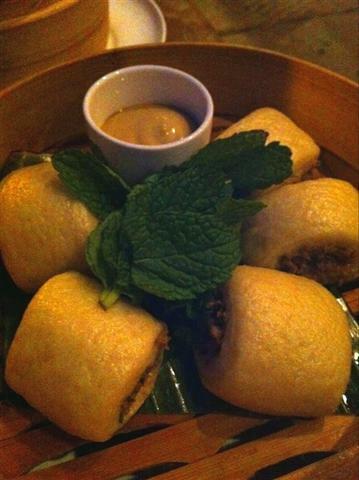 Our other appetizer, the Duck Steamed Buns, fared somewhat similar results. The duck meat had been mixed with cilantro and served with a mustard sauce. The menu had listed hoisin, which I love, so the sauce was a disappointment. Mr. T is allergic to cilantro so this dish was out for him as well. In the end we were somewhat disappointed with our meal but I think we also could have ordered better for ourselves. There was a lot of great looking things on the menu and the décor was so nice I would give it another shot for sure. Apparently they have fantastic bathrooms! How could I have missed that!